What do you want and need the most when you go on holiday with your family? When you book your stay for you and your children the first requirement is to choose a comfortable and spacious room. You want to be sure you will enjoy your holiday, while having the correct amount of privacy for you and your little ones. The family proposal that Rimini usually offers consists of small rooms of 10/12 sqm. where bunk beds are added, making the room difficult to live in. Unfortunately, this does not allow you to have a comfortable stay without ‘’surprises’’. Even small things become a nightmare in spaces like this. 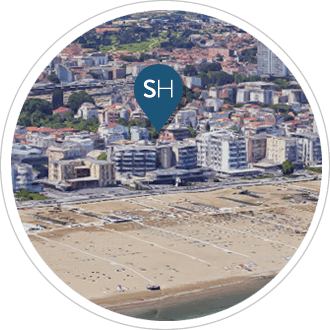 By booking at Savoia, you can be sure to have a large room (at least 20 sqm. – 28 sqm. if we also consider the balcony). You can choose to sleep in our Deluxe family room that allows you to have two large double beds 200x200 cm (78’’x78’’) each. If you would like to have more privacy you can book our interconnecting rooms or suites, where you would also have more space. Clearly, we are on another level. And this is just about the room. The restaurant always prepares a 2-course menu for children. Furthermore, in summer and during the most important periods in winter and spring (such as New Year’s Eve and Easter) there is always a children’s entertainer at dinnertime (from 7.30 pm to 9 pm) that will amuse your children providing a fun evening for them and a calm one for you. Can children use services like the Spa and swimming pools? The outdoor heated swimming pool is always available for kids, meanwhile the Spa only from 9 am to 12 pm. If you want to give you and your family a relaxing and comfortable vacation, that will remain tattooed on your kids’ minds, then book your stay at Savoia Hotel. Great hotel, large room with sea view. Spa very refined and relaxing. Perfect location for going to the beach, with shops and clubs under the hotel. My children had a great time.